Today we’re taking a look at 6 businesses that are neighbours to The Independent at Main, which begins previewing tomorrow. More specifically, we’re introducing you to the humans that run these businesses. As a community Mount Pleasant is artistic and inventive, historic and modern, stylish and spirited. 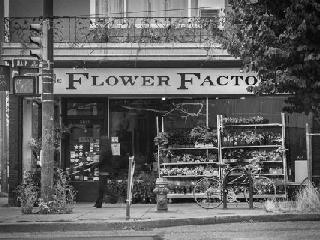 It’s one of the most lively and sought-after neighbourhoods in Vancouver, and these people are a big part of what has made it that way. Jack Bensley and Cameron Forsyth started up the street with Portland Craft, then opened this most excellent craft brewery in the heart of Vancouver’s historical Brewery Creek district. When Vancouver artists Rodney Graham and Shannon Oksanen found out Liberty was for sale they felt had no choice but to buy it! They’ve been regulars for a decade and are re-opening the place soon. One of the newest kids on the block, Briana Wutsch opened up shop in 2014 serving up radicle-y healthy fresh-pressed juices, salads, bowls and soups. Can you think of a better day to open up a Main Street bike shop than on Car Free Day? That’s exactly what Justin Morginn did back in 2013. This community-based sustainable seafood market (and kitchen!) is owned and operated by two of the founding fathers of Ocean Wise: Chef Robert Clark and marine biologist Mike McDermid. Learn more about the Mount Pleasant neighbourhood and the new development being built in the heart of it by visiting independentatmain.com or stopping in on their presentation centre at Main and Broadway. They’re open daily from 12pm–5pm, closed Fridays or by appointment. Next articleVancouver Heritage Foundation Weekly: Heritage Week Feb 16-22!